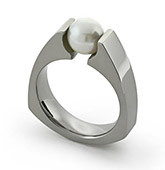 The traditional setting of a stone on a ring typically uses prongs. 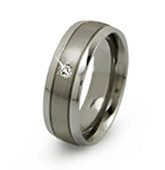 Our titanium rings with diamonds, on the other hand, uses a burnishing technique where the metal is spread evenly all around the diamond. This method is also called flash or direct setting. 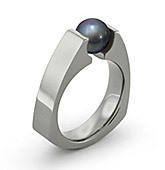 The gemstone is placed in a specially cut opening and the surrounding metal is burnished around it. 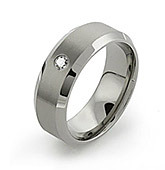 The result is an elegant, high quality titanium ring that holds the stone permanently and securely. 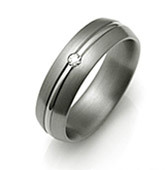 Only Top Quality Diamonds and Precious Gemstones Are Used. 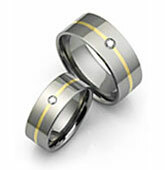 Our titanium burnish (flash) set rings are a great option for wedding bands or simply as beautiful gifts for your beloved. 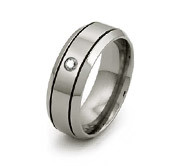 The point is that you can combine the light weight and the strength of titanium with diamonds and other precious gems to achieve the look that is right for you. 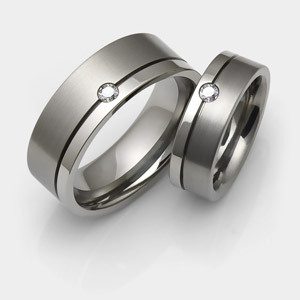 Most of our diamond titanium rings can be ordered with a single diamond or gemstone, 3 diamonds on top, or 7 diamonds equally spaced around the ring. 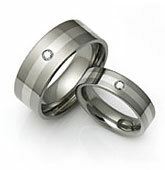 All diamonds are genuine top quality, color, and cut. 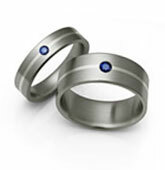 Our stone set rings are also available with 1.3 or 7 sapphires, rubies, black diamonds, and other gems. 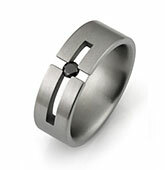 If you are looking for a unique, one-of-a-kind titanium ring, we will happily work with you on a custom design to make it truly your own. 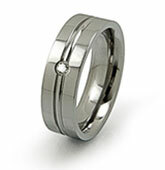 Different number of stones, combinations of gems and diamonds can be arranged, please e-mail us to receive an estimate. 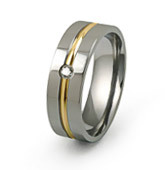 Whether you want a special wedding band made to commemorate a milestone anniversary, or a ring customized for someone special in your life, talk to us, we’ll be more than happy to help. I just ran across this site again and thought I would share my experience. 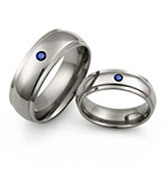 I purchased my husband's wedding ring here over three years ago and do not think I added a testimonial at that time. We encountered excellent customer service and communication. They answered questions and made updates to our order promptly and kindly. 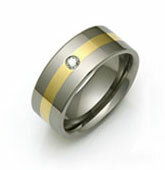 The ring is gorgeous, we chose a brushed finished band with one flush set princess cut stone. The metal ring box was awesome and the shipping was fast. Just wanted to let you know we are very pleased and the ring still looks great today, 3 years later. Please visit our testimonials page for more reviews and endorsements from our clients.